Alliance of Therapy Dogs, formerly Therapy Dogs Incorporated. 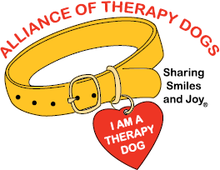 Alliance of Therapy Dogs is a national therapy dog registry with 14,000+ members in the US, Puerto Rico, the U.S. Territories and Canada. Alliance of Therapy Dogs is the nationwide pet therapy group that Best Friends Pet Assisted Therapy tests under. To support Best Friends Pet Assisted Therapy add a toolbar to Internet Explorer or Firefox. Once you add the Best Friends Pet Assisted Therapy toolbar for Internet Explorer or Firefox, each time you shop at one of the more than 1,300 participating stores, a percentage of what you spend will be donated to us at no extra cost to you! (you could even save money as the toolbar provides coupons and deals). The toolbar also has a search box and each time you search the Internet, about a penny is donated to us. No registration is required!